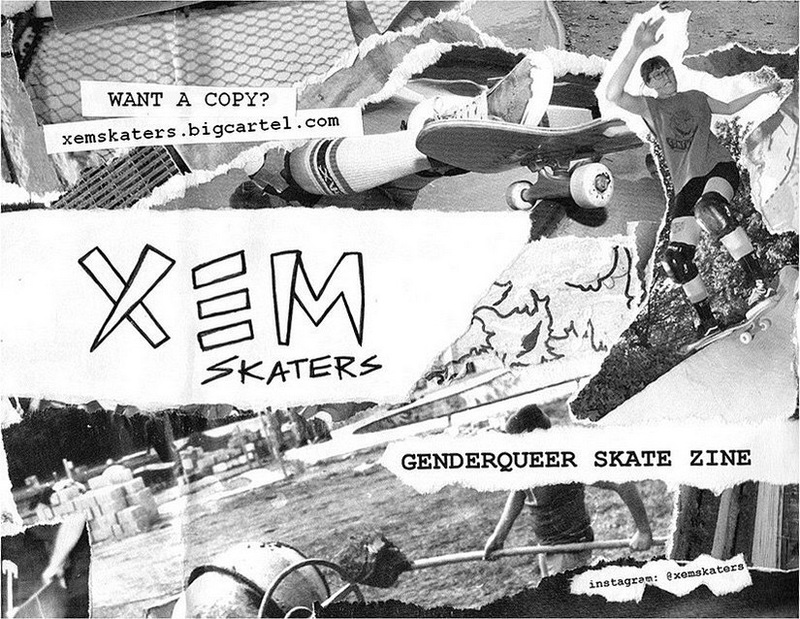 ISSUE TWO OF XEM SKATERS GENDERQUEER SKATE ZINE #2 IS AVAILABLE NOW! Xem Skaters is a genderqueer skate zine by French Skateboarder, Marie Dabbadie. The zine aims to give space to all genders in a binary environment by giving visibility to non­-binary, queer, trans skaters, to introduce gender notions and knowledge in the skateboard community and ultimately open paths for individual identity building within skateboarding. It features anything that is written, produced, created, photographed by genderqueer and genderqueer-friendly people that skate or have something to say about skateboarding and gender. Issue #1 came out in July 2016 and was released during the Unicorn Jam at Mile End Skatepark and during Fellowship exhibition at Parlour Skatestore in London. It was printed over 500 times and shipped worldwide. In this second issue, you’ll find an interview with Jason Bard from Long Island (US), a report from the Xem Skaters’ Copenhagen Spot Crawl, a special feature on traveling anywhere and building DIY skateparks with Jana Malzbier, Ariane Kaiser and Roxana Cernicka, a ‘Recipe for ur sk8nite’ with Skate Like a Girl, a letter to identity from Sweetheart, mixed picture and drawing submissions, zine reviews, a kool playlist from the cave and all you need to know about skateboarding and gender identities. And if you feel generous and want to support a self publishing DIY zine, you can donate here! !